“Okay Google, Turn on my lights!” That’s how a majority of my days start now, thanks to Light Controller and LimitlessLED. Over the last week, I’ve been working on a fork of a LimitlessLED lightbulb controller app I found on Github. I wanted to add some interface touch ups and fix a few features too. When I finished the new features, I sent a pull request through Github to the original project’s author, and now my changes have been merged in and pushed in the latest update to the app which also includes an update to Google’s Material Design. I added a Tasker plugin, which allows Tasker to send commands to lightbulbs. One of my favorite uses of this is in combination with Commandr, an app that allows you to run Tasker commands by voice prompt. Now I can say “Okay Google, light on” and my room’s lights will turn on, or “lights red” and they will glow red. I added a minified widget with just one toggle. 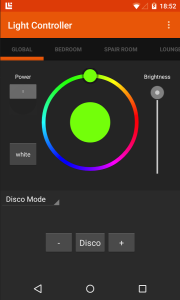 I made the app’s main color change with the color of the lightbulb. I also changed the colors that the music listening modes uses to be less jarring. Here is a screenshot of the new version of the app, now available on Google Play.